The complement system has devastating effects on several forms of glomerulonephritis. 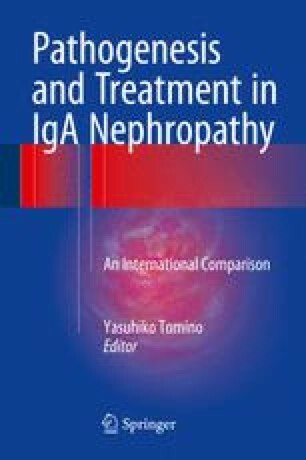 Although the pathogenesis of IgA nephropathy (IgAN) has heterogeneity, ample studies have clearly demonstrated that the alternative and lectin pathways act as an enhancer of glomerular damage. However, certain ligands of starter molecules in these two pathways are not yet identified. On the other hand, the clinical progress of IgAN is often more than a decade, with the patients’ nutritional status fluctuating. An excess of nutrition might exacerbate the natural course of IgAN. Actually, serum levels of C3 fluctuate with not only disease activity but also metabolic parameters. Concomitant with recent genetic analysis, we can deduce that the gene mutations of complement components and regulatory proteins affect disease progression. Mannose-binding lectin (MBL) deficiency is very common in a normal population, but conversely, patients with sufficient MBL have a risk for a worse prognosis of IgAN. This review documents contemporary information concerning the possible role of the complement system in the pathogenesis of IgAN.